My Hoover colleagues David Brady and Mo Fiorina gave a recent talk updating some of their work on polling American political opinions. I found this one particularly interesting. 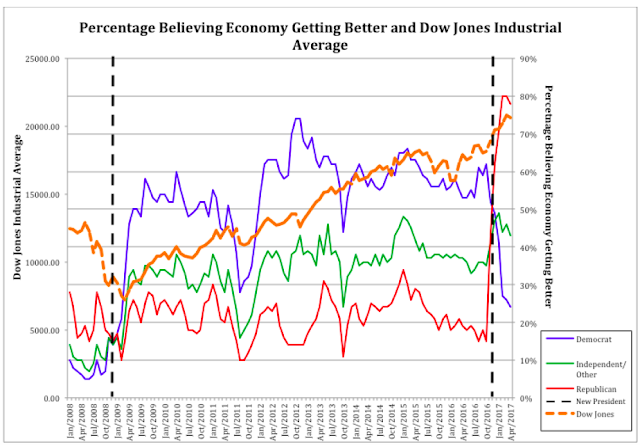 Notice how after President Obama's first win in 2008, the fraction of Democrats reporting that the economy is getting better jumped from 10% to 50%. The Republican fraction declined, though not as much. When Trump was elected in 2016, the Republican opinion jumped from 15% to 80%, and Democrats fell from 60% to 25%. Having not heard the talk, what (if anything) did the authors have to say about why? Strategic voting (knowing their answer would be part of a reported statistic)? This is evidence of bias toward how much control the president exerts over the economy. It is further evidence of home team bias. "This is evidence of bias toward how much control the president exerts over the economy." This is evidence of how much control PEOPLE BELIEVE the president has over the economy. It is also evidence of the crap that passes for economic research these days. Nothing against the 30 companies in the DJIA, but they represent a tiny fraction of total U. S. economic income and output. A careful examination of the chart shown would indicate that the 3 categories of voter are remarkably correlated (excepting on the occasion of a changeover in administrations). This is concerning. Republicans aren't a monolithic group (I am one and I can't stand Trump). If the Republicans surveyed went from 15% to 80% basically on the day Trump was elected, they aren't very observant. The economy has been improving since about mid-2009, and it is pretty obvious from stock prices and unemployment numbers. My suspicion is that only highly partisan Republicans and Democrats were surveyed, and that the middle third of the electorate, most of which actually voted for a Republican or a Democrat, was classified as independent for the purpose of this survey. It is to be expected that partisans will believe that things will get better in the future when their candidate wins. What is remarkable is that for a long period of time only about 25% of Republicans thought things were getting better and they were consistent right through the recession and a large stock market boom with falling unemployment. Are Republicans chronically pessimistic/depressive or did they all hate Obama so much that they would on mass deny the evidence before their eyes? "Are Republicans chronically pessimistic/depressive or did they all hate Obama so much that they would on mass deny the evidence before their eyes?" Judging solely by the Republicans in my extended family circles, the latter. A steady diet of Fox News has really made them completely out of touch with any semblance of reality. Furthermore, when pressed to explain what they would like to see policy wise, they would almost certainly be Democrats. "Is the economy getting better" is a very vague question, especially if the answer is forward looking. If one believes that the president has the ability to alter regulations and taxes then a step change in expectations is completely rational, especially if the election was surprising. There are infinite ways to slice-and-dice the vague phrase "economy getting better." Which is, I suspect, exactly why Brady & Fiorina chose that particular term. Democrats can say "of course the economy was improving 2008-2016, look at unemployment!" while Republicans can say "but labor participation rates are lagging, and what happened to 3% growth?!?!"